What’s better than the natural hair movement? A mobile natural hair salon that sends expert stylists to your doorstep. You don’t have to fight traffic or run to the train and sit in a salon all damn day. Tresse Noire (based in Philadelphia, but expanding to NYC, soon) is the naturalistas gift from the natural hair gawds. Ran by Beautifully Brown best friends Octavia and Regina, Tresse Noire is leading the new-age salon experience for Black women on the East Coast. Beautifully Brown: What is Tresse Noire? What are the services that you offer and where? 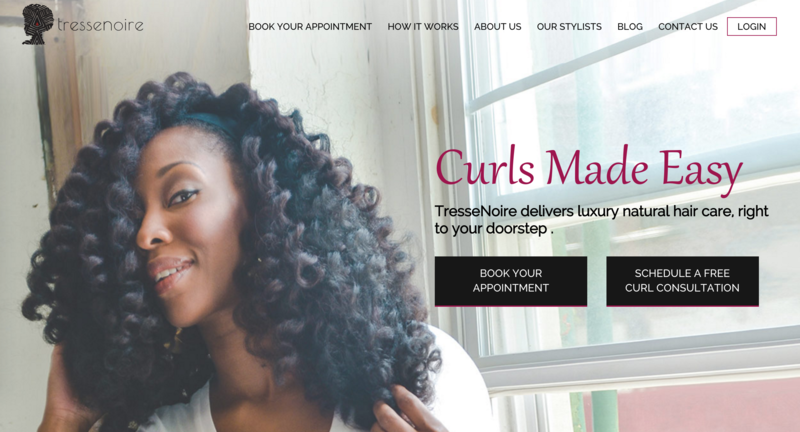 Tresse Noire: So, Tresse Noire is a web-based, Philadelphia-based, traveling natural hairstyling service. We offer on-demand natural hair care services to professional women of color to manage and simplify their lives. We’re Philadelphia-based, but we are expanding into New York City. We offer some services in New Jersey, too. We also offer some services in Delaware, West Chester County, and parts of Long Island. BB: Are the services catered to natural hair only? TN: Our focus and expertise is natural hair care; however, our mission is to connect professional women of color to hair stylists. So, if women have chemically treated hair, we will style them as well and offer them hair care regimens. A lot of women are transitioning, so they are still relaxed and are looking to transition. But we also offer services to anyone who needs us. BB: So, how did you even begin the company, it’s such a cool service? 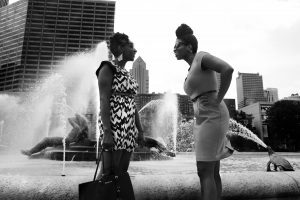 TN: You know, we’ve both been naturalistas for over a decade each, and we started looking at our services. We started looking at the options we had in the natural hair service industry. It had gotten to the point where I was bringing a hot spot Wi-Fi, computer, books, food, drinks and so on to my old stylist’ salon because I knew I was going to be there all day. Or on the flip side, I was hearing about amazing salons in New York that you were spending between two and three-hundred dollars for. There was no balance. Also looking at the city, you see the Dry Bars popping up and the blow bars and the Glam Squad and so on. But not one of them catered to the types of styles that I was looking for. So, that was really the impetus. We were both on vacation figuring out our lives and what we were going to do and Octavia’s like, “I really, really want a hair salon”. And I said, “That is awesome! How do we combine hair and technology?” That was basically kind of where Tresse Noire came from. BB: How do women book their services? TN: An app is in the works. But for now, women can go to the website. With our future app, you’ll be able to book an appointment, select your location and then choose your stylist and service of choice. BB: Do you use the hair typing method to help women find their curl pattern? TN: I think it’s a way to get on a path. But because your hair can grow in different curl patterns on your head, and your hair changes over time, it’s kind of hard to say, “You definitely have 3A or 4C”. I think it’s helpful to know what ballpark you’re in because if you don’t have Tracee Ellis Ross hair, there’s no amount of product that’s going to get you there. So I think it helps to get you into a lane. The density and porosity of your hair makes more of a difference than your curl pattern in terms of the types of products you use and how you take care of it. Those types of things are what our stylists go over. BB: What kind of other styles do you offer? TN: Children’s styles, up-dos, blow-outs, crochet weaves – you name it, we do it. We do full sew-in’s, too. We do everything. BB: Do women end up paying more with you than they would in a salon? Or is it about the same? TN: We would say it’s about the same. We’re priced at a premium, but we’re less than luxury salons. On average, you’re going to pay 100-120 dollars. BB: Well, that’s close to what you pay at the salon. And you’re in and out. TN: Right, and you’re not fighting the traffic. You’re not fighting the train. You’re not fighting the weather. You’re not parking. All you’re doing is sitting in the house. Your hair should be washed and detangled before we arrive. We will either re-wet it depending on the style or we come with blow dryers. We come with soft-hooded dryers for a rod set. We come with all the materials that are needed to achieve the style that you want. BB: How have you witnessed this service change the lives of women? TN: I have not been to a salon in a year and I can’t imagine going back. You know, with a few exceptions. I’ve heard women call us and say that their stylists hug and kiss them before they leave and they’re so happy with their hair. We have a good re-booking rate with clients coming back. Our clients are referring us to their family and friends. We’ve sort of tapped into a very niche market of women who love our services and who also love the personalized service that they get. We know our customers by name. We know what event they were going to. It’s also the personal touches. We consider this a luxury salon experience. We come and set the mood. We set the environment of pampering and personalized attention and continue that experience even after we leave. I think that’s a big difference between just going to a salon. And It’s not just about the styling. It’s about the education that we provide with the curl consultation. We have a special sauce. We don’t really like to tell the world. But, we got a thang. You’re not going to sit on the floor between somebody’s knees. That’s not what we do. These are beauty professionals that have been trained by Aveda and John Paul Mitchell and Carol’s Daughter and Shea Moisture. Our stylist network is curated to make sure that we have the best of the best.